Look at any fast food chain’s menu and you are bound to find one item that is deep-fried like a fritter which in Hindi is a Pakora. Deep frying food has its benefits. Food lasts longer, it gets sanitized due to the high temperature cooking and safe to carry while travelling or store for long periods without refrigeration. Foods like Kachori, Puri, Pakora, Bread Pakoras and many other deep-fried delicacies have their origin in the necessity of storing food without refrigeration. When there is so much of the good stuff, why not make more? That’s probably how the use of bread for pakoras began. Leavened bread – of the sandwich kind – is not native to the Indian subcontinent but over the years it has become a part of meals like breakfast and tea time snacks. Typically bread pakoras are made by first making a sandwich with a filling of spiced mashed potatoes and then dipping it in the batter to fry. 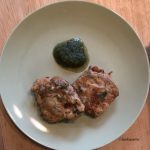 But, for a lot of folks that are hungry and want their pakoras FAST, there is an alternative at hand – the Easy Bread Pakora. These come from a friend’s kitchen in New Jersey. On a cold December morning Garima whisked up the batter and in no time there were hot pakoras for everyone. Before prepping ingredients put a deep wok or pan on the stove at high heat. Add oil to this and let it heat up. After a few minutes, reduce heat to medium high while you work on the batter. The oil should not smoke. Cut 6 bread slices into equal squares – 4 per slice and keep aside. I choose not to cut away the edges, but you can choose to do that. Measure besan and add it to a large mixing bowl. To this add all the dry spices and salt and pepper. Chop up scallions, an onion, fresh coriander and green chillies (if using chillies – remove the pith and seeds). ***Be careful while handling chillies, wash your hands immediately after cleaning and chopping them and DO NOT touch your face. Next, transfer all the chopped ingredients to the bowl. Start adding water 1/2 cup at a time and whisk everything together until you get a smooth batter with a consistency similar to pancake batter. To this add the bread pieces that have been waiting. Let them soak on one side for approximately 30 seconds, then turn and soak for another 30 seconds ~ 1 minute in all. Bread will absorb flavour from the batter. If bread still remains dry, soak longer. First test the oil with a teaspoon full of the batter. If it starts spluttering and rises quickly to the top, then oil is ready for frying. Next, pick one piece at a time of batter soaked and coated bread and, drop gently into the oil. You should be able to fry a few of them at once. Fry until a golden brown, turning once in between to cook evenly on both sides. Remove with a slotted spoon and drain paper towels or napkins before serving. To add a sour zing sprinkle a little chaat masala or amchoor (dry mango powder) topped off with a squeeze of lime juice before biting in. Bread Pakoras are an easy to make snack that are hearty enough to be a breakfast or an easy meal during long journeys. Put a deep wok or pan on the stove at high heat. Reduce heat to medium high while you work on the batter. Cut 6 bread slices into equal squares – 4 per slice and keep aside. Measure besan and add it to a large mixing bowl. To besan add all the dry spices and salt and pepper. Next, transfer all the chopped ingredients to the bowl. Start adding water 1/2 cup at a time and whisk everything together until you get a smooth batter with a consistency similar to pancake batter. To this add the bread pieces that have been waiting. Soak on one side for approximately 30 seconds, then turn and soak for another 30 seconds ~ 1 minute in all. First test the oil with a teaspoon full of the batter. If it starts spluttering and rises quickly to the top, then oil is ready for frying. Next, drop a slice of bread gently into the oil. Fry until a golden brown, turning once in between to cook evenly on both sides. Remove with a slotted spoon and drain paper towels or napkins before serving. I choose not to cut away the edges of bread slices, but you can choose to do that. If using chillies – remove the pith and seeds.